APOLOGIES FOR THE LACK OF UPDATES FOR THE FOLLOWING YEARS. 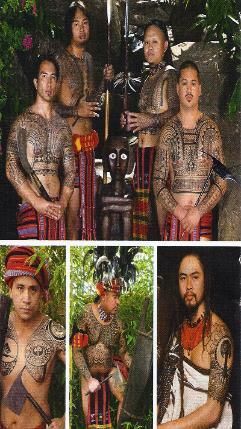 AS YOU NOTICE BELOW WHEN WE UPDATE THE TRIBE MEMBERS’ PAGE WITH GALLERIES OF PICTURES AND TATTOOS OF CLIENTS WE NOTICE MANY, WHO TEND TO TAKE THE SHORTCUT OF RESEARCHING THEIR OWN ROOTS, FROM FILIPINOS TO DIFFERENT ETHNIC DIVERSITIES THEY TEND TO COPY THESE SACRED TATTOO MOTIFS THAT ARE RESEARCHED ONLY FOR THAT CERTAIN INDIVIDUAL THAT CAME TO US. WHEN THEY ARE POSTED ON OUR SITE THEY ARE COPIED LIKE A TATTOO FLASH. SO IT HAS COME TO OUR ATTENTION THAT THE ONLY WAY TO KEEP THESE TATTOOS SACRED IS TO KEEP OUR GALLERY LIMITED AND UPDATE ONCE IN A WHILE. SO CHECK BACK FOR RECENT UPDATES AS WE WILL BE UPDATING EVENTS AS THEY DEVELOP. THANK YOU FOR YOUR CONTINUED SUPPORT IN OUR ENDEAVORS IN REVIVING FILIPINO TATTOO TRADITIONS. MARAMING SALAMAT! [LEFT] Tribe member, Jason Tauti, Amang-RED. 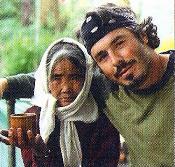 [RIGHT] It is obvious this is a person who copied one of the tribe members’ chest tattoos – his tattoo motif and his storyline. KALINGA TATTOO is a photographic masterpiece that explores the vanishing art of Kalinga tribal tattooing in the remote mountains of the northern Philippines. Combining the visionary talents of numerous international photographers and the words and stories of nearly fifty Kalinga elders, KALINGA TATTOO is the first book to tell the story of this incredibly rich tradition of indigenous body art that is believed to be 1,000 years old. Here’s a rare trove of tattoo motifs,variations and interpretations which can reveal new perspectives for every interested tattooist. Krutak continues with an historical exploration entitled HISTORY OF KALINGA TATTOO that focuses on those cultural institutions that were deeply intertwined with Kalinga tattooing itself. Dramatic images of tattooed men and women taken over the last 100 years and colorful village scenes and landscapes accentuate the chapter. Lars’ detailed study into the significance of Kalinga tattooing proceeds with an illustrated discussion of the artistic motifs that comprise Kalinga tattoo art. This chapter, KALINGA TATTOO MOTIFS, is an absolute must read for anyone seeking knowledge (spiritual or otherwise) of the real roots of tribal tattooing practices that are largely disappearing around the world today. Because warrior culture, headhunting, and religious ritual permeated nearly every facet of Kalinga tattooing practice, WARRIOR CULTURE OF THE KALINGA, focuses on these customs. Krutak recounts his experiences with Kalinga warriors (old and new) and breathes life into long-forgotten Kalinga literature revolving around human sacrifice and other ceremonies associated with the human hunt. The nature of the research is outstanding and wonderfully detailed, and the words (and actions) of his Kalinga informants are truly unforgettable. What follows these texts is a remarkably beautiful photographic exhibition of the last generation of Kalinga warriors in vivid color who earned their tattoos on the field of battle. THE LAST KALINGA TATTOO ARTIST looks at the life and work of Whang-Od, the last Kalinga mambabatok or tattooist, who dedicated her life to the art of her ancestors. Krutak, who lived with the master artisan for nearly two weeks, exposes for the first time in history the biography of this unique woman who for more than seventy years has plied the skins of countless generations of Kalinga men and women with thorns and other natural tools. Finally, MARK OF THE FOUR WAVES TRIBE documents the artistic achievements of a growing number of young Filipino-Americans who since 1998 have each made a conscious individual effort to revive the indigenous tattooing traditions of the Kalinga and other tribal peoples of the Philippines. 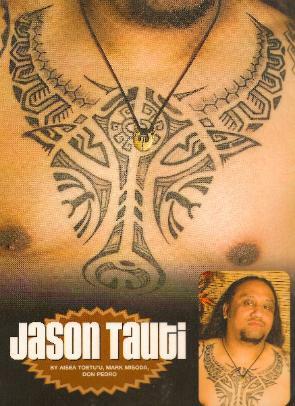 Whether through hand-tapping, hand-poking, or machine work, the Tribe’s dedication to “The Movement” has resulted in the revitalization of timeworn tribal designs with new design concepts that are beginning to approach the longstanding accomplishments of Polynesian artists who guided the tattoo renaissance across the Pacific in the early 1980s. For Krutak and Sugguiyao, the Tribe represents the very best of contemporary tribal tattoo culture because they dynamically express the enduring strength of time-tested indelible traditions that firmly anchor indigenous and modern concepts of identity on the skin for all to see. This amazing book is a photographic journey across the globe – from Borneo to Belgium, Argentina to Athens, New York to New Zealand and beyond – in search of avant-garde tattoo art that pays homage to the ancient roots of tattooing in their contemporary interpretations. No other publication has curated the work of so many esteemed international tattooists working in black ink and gathered them into one compre-hensive volume. The journey begins with a look at the history of tattooing before featuring black tattoo portfolios divided into the following chapters: Neotribal, Dotwork, Art Brut, Traditional Revival and Thai/Buddhist. The Neotribal chapter showcases the work of those specializing in contemporary interpretations of traditional tattooing and the melding of various cultural motifs. 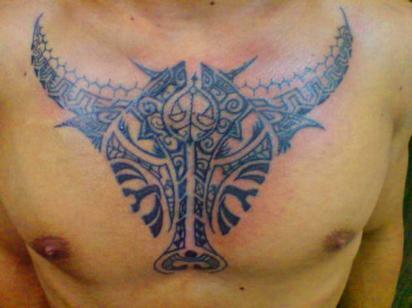 This tattoo work is particularly sought after for its harmony with the contours of the body. The photos in this chapter are preceded by an interview with the artist considered the godfather of Neotribal tattooing, Leo Zulueta. Following Leo is a Q&A with one of today’s top artists in this style, Daniel DiMattia of Calypso Tattoo in Belgium. Dotwork tattooing, also called stippling, has gained enormous popularity in recent years as a way to shade, add depth and texture tattoo art. The literal buzz over London’s Xed Le Head’s rotary machine creations was heard around the world energizing others to try their hand at Dotwork. Colin Dale, renowned for this style as well, discusses how he creates his body art using hand tools rather than a machine. Photos of Dotwork tattoos, from geometric patterns to ancient Nordic art, are displayed in this chapter. The hardest chapter to label is that of Art Brut because the style simply does not have a title – in fact, it rebels against any categorization. If tattooing is considered outsider art, this is the outsider art of the outsiders. We call it Art Brut, or raw art, a term coined by Jean Dubuffet for art beyond aesthetic norms. The spontaneity and fever that the work embodies is often mistaken for simple, crude line work but nothing could be farther from the truth. In this chapter, the man who has sparked the Art Brut tattoo style, Yann Black of France, discusses the passion and painstaking methods behind his portfolio. Traditional Revival looks at those who honor indigenous tattoo cultures by carrying on their art, customs, technique and spirit. 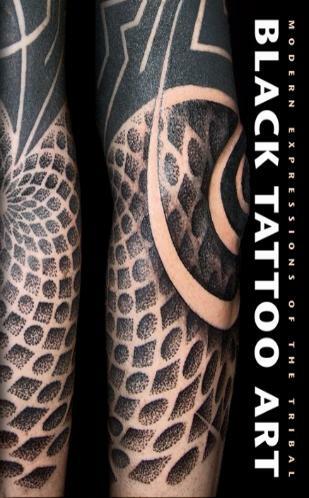 While this book is centered around modern Blackwork, it is necessary to look back at where today’s tattooing derived. 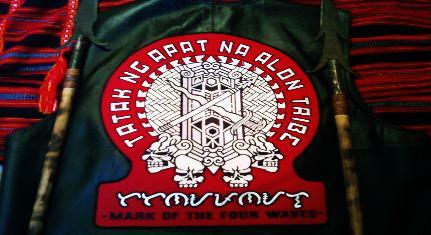 The chapter begins with the Tatak Ng Apat Na Alon Tribe, which means the Mark of the Four Waves. Then, there’s the story of Volker Kloth, a German man, who was inducted into the ways of Ta Moko, the ancient art of the Maori in New Zealand. Photos of their works follow the interviews, in addition to images of traditional handwork from Borneo by Jeremy of Monkey Tattoo, and the soulful art from Tahiti by Roonui Anania of Tahiti Tattoos. Finally, the Thai and Buddhist art-inspired chapter begins with the incredible story of Peter Schachner, who was imprisoned in Thailand in the early nineties and learned the craft of hand-poked tattooing from fellow inmates over the four years spent at Lard Yao prison – a name he uses when he tattoos on the road to honor his teachers. Images of his work are exhibited along with those of other tattooists including Mike The Athens of Greece and Jondix of Spain, who strive to keep tattooing a spiritual practice. “Black & Grey Tattoo” is a mammoth work. Comprising over a thousand pages, it is one of the largest – if not the largest – tattoo book ever published! Its three large-format volumes are contained inside a lavish and sturdy hardcover box. The set explores a monochrome art form through a kaleidoscope of the most widely diverse interpretations and craftsmanly techniques, performed by tattoo artists from all parts of the world. This tattoo tome explores the origins of black & grey tattooing – from the prisons and streets of LA to its contemporary resonance on Hollywood’s red carpets, at heavy metal music festivals, and in private ateliers from Budapest to Beijing. While rendered in just shades of grade, the spectrum of design is vast: Aztec warriors, fierce harpies, family portraits, religious icons and permanent shrines to celebrities adorn these pages. The common thread among them all is their inventive exposition and mastery of execution. 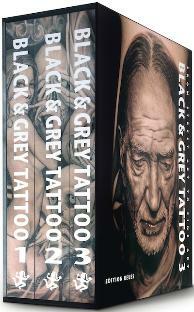 It is divided into three volumes: “Traditional Black & Grey”, “Dark/Horror” and “Photorealism”. Indeed, there is cross-pollination among the different styles, but the breakdown is not just for easier lifting of this monster collection. It is to show how tattoos with similar stylistic elements are interpreted differently by stellar artists around the world. The books also present the fine art – including paintings and charcoals – of many of those featured, although the tattoos themselves should be considered fine art. Food and Beverage will be provided while they last. Come join Tatak Ng Apat Na Alon Tribe at the 17th Annual Festival of Philippine Arts and Culture at Pt. Fermin Park, 807 W. Paseo Del Mar, San Pedro, CA from 10am to 6pm. This year’s theme is katutubong landas tungo masaganang bukas – “native ways toward a prosperous future.” It is our native ways, our traditions, that anchor our community. It is also through our native ways, our human experiences, that we find common threads that interweave the diverse communities that make up our landscape. Whether we refer to “community” as the youth, the various groups that make up Los Angeles, or the community of Pilipinos worldwide, it is our native ways – of song, of dance, of art, of cuisine, of cultivating the ear – that we pass on to the future of generations, to continue to ensure a prosperous future. Come for the whole day and enjoy a wide variety of food, clothing, artwork, books, and other memorabilia will be sold at the event. FPAC features a wide array of cultural and artistic showcases and activities. Tatak Ng Apat Na Alon will have a booth for anyone interested in tattoos or just inquiring some more information about the revival. Hope to see you there!